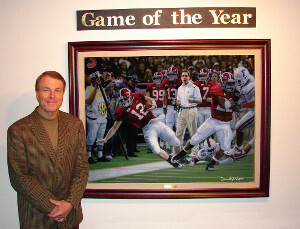 2005 Sport Artist of the Year Daniel Moore with the Academy’s 2009 College Football Game of the Year Award painting. Alabama quarterback Greg McElroy’s key third-down conversion in the 2009 Southeastern Conference Championship Game was relived through the colorful vision of Daniel Moore when the United States Sports Academy’s 2009 College Football Game of the Year painting was unveiled at an art show on the Academy’s Daphne campus Thursday. At the “Tribute to Alabama Football” art show, Moore, the 2005 American Sport Art Museum and Archives (ASAMA) Sport Artist of the Year, used the opportunity to pay tribute to the Crimson Tide’s starting quarterback. The painting depicts McElroy stepping out of bounds at the first down marker after tip-toeing outside the sidelines for a key third-down play in Alabama’s 32-13 victory over Florida. Moore donated forty-one certified limited edition prints depicting the Alabama-Auburn football rivalry, and they were placed on sale through a silent auction during the show. These works are featured in Moore’s book Iron Bowl Gold. The prints depict each of the Alabama-Auburn games, traditionally called the Iron Bowl, played from 1948 through 1988. While the Alabama-Auburn series is now a “home and home” event, these games were played on a neutral site, Legion Field in Birmingham, during that 41-year span. Copies of Iron Bowl Gold were purchased and personalized by Moore. Written by legendary football announcer, Keith Jackson, additional copies of the book are currently available in the Academy Bookstore. The members of the College Football Game of the Year Committee read like a “Who’s Who” in college football. Consisting of eminent sport leaders, the committee contains former athletic directors and/or individuals active in collegiate football, who meet the criteria to serve on the committee and exhibit no bias in their vote. Jacksonville State stunned the University of Mississippi in a 49-48 double-overtime upset win in Oxford, Mississippi. James Madison University surprised heavily-favored Virginia Tech in an exciting 21-16 victory. Using a fake field goal in overtime the Michigan State Spartans surprised Notre Dame and scored the winning touchdown in overtime 34-31. UCLA took a 1-2 record into Austin, Texas, and shocked the No. 7 Texas Longhorns 34-12. No. 4 Oregon fell behind No. 9 Stanford 21-3 in the first quarter, then mounted an offensive attack that took them past the Stanford Cardinal to post a 52-31 victory.